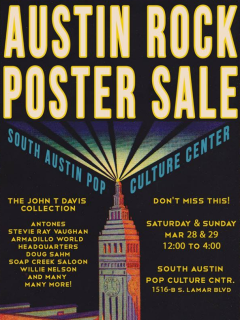 The South Austin Popular Culture Center is proud to host the sale of John T. Davis' stunning poster collection. Davis (a longtime CultureMap contributor) has lived in Austin for most of his life, writing about the music, personalities and the culture of Texas and the Southwest. From Armadillo World Headquarters and Soap Creek Saloon to Antone's and Liberty Lunch, his collection of more than 400 gig posters is a stunning representation of four decades of Austin music history. Preview the collection before you come on out and get a piece of it yourself.